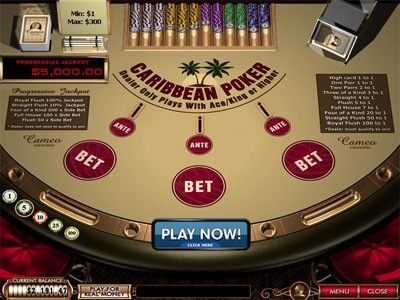 Caribbean Stud, often referred to and known as Caribbean Poker, is one of, if not the most popular variation of casino poker. Unlike what is typically referred to as online poker, this form is played against the house and as per ‘se also features an advantage. Back to the main topic, though. Just like 5 card stud, this game is also played using 5 cards. Each of the competitor sides (player and casino) gets a hand, which consists of 5 cards, dealt. Hands are valued same way as in a normal holdem or stud game – combination is made out of five cards with the best possible one being royal flush. One little add-on, before we jump into gameplay, rules and other aspects of this game, is that players also stand a chance of claiming a progressive jackpot, which is often quite significant. Simplicity is key to gaining popularity, when it comes to casinos games. This is exactly what this game is about, hence the popularity. You’ll see two main betting boxes that are shaped as circles, one is titled as ”ante” while the second reads ”call”. If you are playing a progressive variation (and you should be), there also will be a circle shaped ”jackpot” wagering box, that usually allows only 1 coin denomination to be wagered – $/£1. ”Ante” is the main bet of the game and one that is required to be wagered, otherwise no cards are dealt. Once placed, you’ll get a 5 card hand dealt faceup while dealer will only show one of his cards. ”Call” is the main decision that has to be made in Caribbean Stud, as ”ante” is a forced bet to play in the first place. Making the call will lead to dealer opening all his cards and hands being compared. However, players are also allowed to ”Fold”, which is basically giving up and losing your ante bet. This is mostly done, when chances of winning that particular hand are slim to say the least. You’ve just learned about the basics and foundation of this game. To be fair, you can already jump into action and play this game at Winner Casino right away. However, if you’re interested in learning a little bit more, keep reading. Next paragraph will include a couple of cruicial rules as well as payouts is. This casino poker game features a payout table, which is used to pay winnings and determine odds for the ”call” wager. These payouts completely depend on the strength of your hand and one additional aspect – whether the dealer holds a qualifying hand. So what does ”qualifying hand” refer to? It’s the hand strength for dealers hand, which is used to determine whether the paytable is accounted for or not. Dealer holds a qualifying hand, if the 5 cards he has dealt to himself create a hand combination equal or better than AKXXX, where ”x” are random cards. So any hand that consists of an at least ace-king is a qualifying one. What happens if the dealer does not qualify? You win! That’s true, but you only win an even money payout on your ”ante” bet while ”call” bet is pushed. This is regardless of your hand combination, so in order to make your way towards huge payouts, you want dealer to qualify! I’ve seen the complete optimal strategy for Caribbean Stud Poker – it was very, very complex and you probably should not bother looking for it. However, here are few really simple rules that will help you to decrease the house edge to approximately 0.12% when applied. You hold AKxxx and the card dealer shows is matching one of yours. If none of the situations outlined above are true, you should simple ”fold” and give up your ante bet. You are all set for playing Caribbean Poker online and applying basic strategy while doing so! If you have limited funds, I can advise to give Winner Casino a try! They are powered by PlayTech, offer a great variation of this poker game and what’s most important, they will give you £/$30 in FREE credits! No Credit Card required, no small print – sign up and this cash will be waiting for you!